For a few months in high school, I worked at my local Boston Market. It was an okay job - first and foremost, all the free cornbread I could ever want - but man, there's a few things that, close to twenty years later, kinda stick with me. Like the barrel of some sort of acid used to "clean" all the rotisserie skewers. Gross, hold your breath when walking by. Or how my assistant manager there regularly lit up while in the kitchen...during dinner rushes...while prepping food. That "smoked" turkey on the menu wasn't false advertising. ...which is exactly how I made this Indian dish, in only a slightly more traditional method than nuking in our microwave. I literally submerged the package, as shown, in a boiling pot of water to warm up this shelf-stable lentil stew-like dish. I guess it's only weird if it doesn't work. The tadka dal certainly works, as far as my tongue can ascertain. I can't tell you how authentic it is or isn't, but I can tell you both Sandy and I thoroughly enjoyed it. 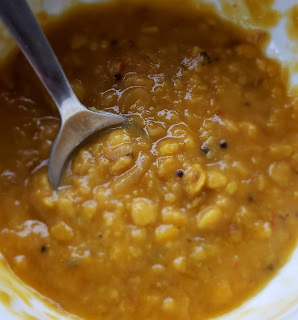 Tadka dal, if you're not familiar, is a fairly common spiced lentil dish in Indian cuisine. What we both enjoyed most was the warm, welcoming "glow" of the spices. I'm not sure how else to explain it. While somewhat spicy, it wasn't straight up heat, but there's not a complex depth to it either. It's not the same as other spices that you'd expect from, say, a tikka masala. Curry plays a part, but I'd wager on it being a bit heavy on the turmeric, which is just fine by me. You can see how yellow this stuff is. The lentils are, well, lentil-like. What is there to really say about them? But they add earthiness and body to the creamy tomato broth base. There's enough lentils that it didn't even really seem all that tomato like, so that's a plus in Sandy's book. She might not even realize there were tomatoes in it until she reads this...I guess we'll find out. In any event, we both wish we had some naan to help get every last bit of the tadka dal into our belly. Speaking of wishing for naan...the tadka dal is really more a side dish, or at least in need of something else to fill out to a full meal. We went cross-cultural with falaffels, but at least have some rice on hand to serve alongside. Bringing one thing back: make note of the "creamy" aspect. 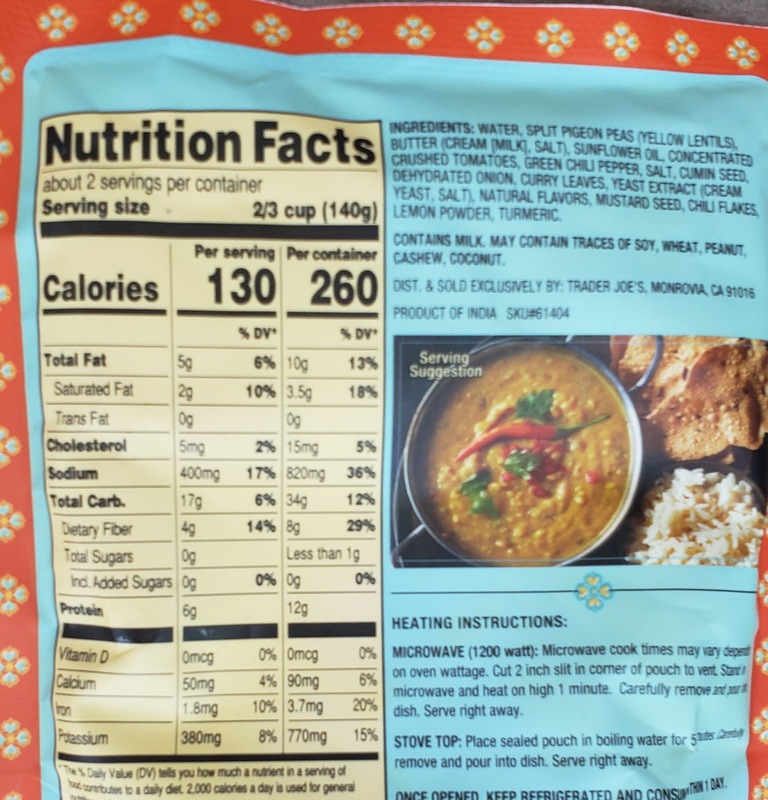 Yup, sorry vegan lentil-lovers out there, there's milk in the ingredients here. From what I can tell from a quick Google search, many if not most tadka dal recipes can be or are vegan. So there's a potential knock. For $1.99, we were happy. It's definitely repeat purchase-type material for us. If this TJ's tadka dal were a side dish or option at an Indian buffet, we'd be happy. Just get it out of the bag before bringing it out. Double fours. I looooove dal! Too bad about the dairy which is a dealbreaker for my tummy. 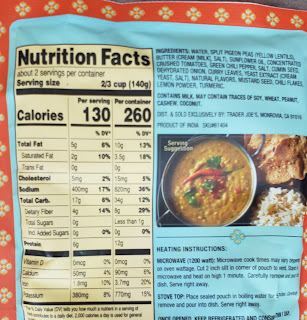 My bff’s husband (i call him my best friend in law ;) is indian and one of his comfort food cravings is a bowl of rice and dal with a big gob of thick yogurt; makes sense in a way so the yogurt adds some protein and counteracts the heat of the dal. I used the Indian vegetable pouch to make shakshuka style. I just thin out with water to make the poaching liquid for the eggs. Crack eggs in there add some salt and pepper then let it cook for few mins. It become thick making an amazing "side" to go with the eggs. 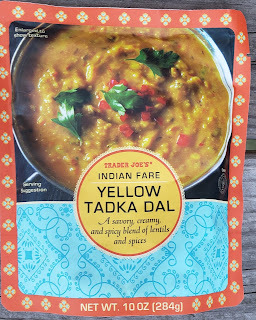 I love Indian food so was happy to find this dal and the tikka vegetables that Aleksandr Rozentsvit mentioned at Trader Joe's. I had both for dinner tonight, with brown rice and yogurt, and they made a very decent light meal. They're a little spicy, which is welcome, and I love Aleksandr's idea of cooking eggs in the vegetables, a la shakshuka! That with some naan would make a great meal. My store also had a paneer pouch of some sort, too, though I don't remember exactly what it was.